Yesterday, Christine Coleman of Aaron Miles’ Fastball went a different direction in her countdown. I’m pretty sure she’ll agree with our selection today. And really, there’s little competition. Fans of the Whiteyball era might clamor for Coleman to get the nod, and he does have a worthy case, but it’s hard to say that even his exploits top what Chris Carpenter has meant to this organization over the last decade. 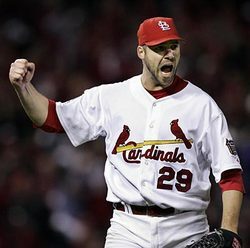 The only Cardinal Cy Young winner since Bob Gibson, his arm was crucial in the World Series runs of 2006 and 2011. His matchup with Roy Halladay in Game 5 of the ’11 NLDS is possibly the best overall game we’ve seen in the playoffs in a long time. Carpenter’s demeanor and competitive spirit are legendary. Whether it’s reaming out Brendan Ryan on TV for showing up late or being the pitcher Reds fans (and others) love to hate, Carpenter has built a legacy in St. Louis that won’t soon be forgotten. I’m not sure when he’s going to be eligible for the Cardinal Hall of Fame ballot, but it would seem like he’s a slam-dunk first-ballot selection when the time comes. Less than a month until baseball season. Even Carp is pumped!